We understand how important the health of your children is to you and this makes it all the more important to us. Kids 1st are committed to promoting a healthy lifestyle in a bid to help all of the children who attend our nurseries on their way to a long and healthy life. 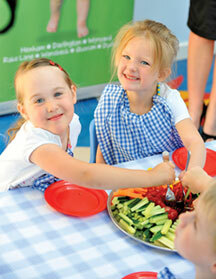 We are passionate about the quality of food that we serve and the tastes and flavours that your children experience. All of the food served in our nurseries is freshly prepared everyday by our team of Chefs. We use only quality branded products and have a policy of no added salt and minimal sugar. At Kids 1st we try to instil traditional values such as respect, manners and positive behaviour and this is carried through to mealtimes. Children are encouraged to eat in our dining rooms at the table like they would a family meal. We recognise that exercise is a key part of a healthy lifestyle and we encourage our children to play outside in our beautiful gardens regardless of the unpredictable British weather. We also have structured physical fitness programmes delivered by fully trained coaches to ensure that your little ones get age appropriate exercise. Kids 1st has always had a Healthy Lifestyle Policy and we are very proactive in making changes to the food, menus and processes. In 2012, in line with the government’s ‘Eat Better, Start Better’ guide, we produced a new ‘Food and Healthy Lifestyle Policy’ which sets out our aims as a company with regards to a healthy lifestyle and mealtimes and then goes on to outline how we plan to achieve these aims. The document is available in all of our nurseries for parents to read; it is quite comprehensive and should provide you with everything you need to know about the food, menus and processes at Kids 1st. The menu below is just a sample of the food that we offer at Kids 1st. At lunchtimes an alternative option is also available. A glass of diluted fruit juice, served with a selection of cereals with chopped fruit and homemade malt loaf. Mild Mexican chilli with quorn mince, served with boiled rice. Potato skins with melted cheese and ham. A glass of diluted fruit juice, served with a selection of cereals with chopped fruit and white/brown toast. A fishy salmon and potato pie topped with cheddar cheese and served with seasonal vegetables. A glass of diluted fruit juice, served with a selection of cereals with chopped fruit and toasted teacakes. Mediterranean Pork served with penne pasta. Cheese on toast with cherry tomatoes . Fruity rice crispy squares with a glass of milk. Fruity chicken curry served with fluffy rice. Vegi Burger served in a floured bun with tomato relish and carrot sticks. Homemade fruit milkshake and cookie . Savoury minced beef with Yorkshire puds, roasted potatoes peas and sweet corn. Pasta, parmesan, cherry tomato, cucumber and yellow pepper salad. Banana loaf with a glass of milk.